Happy 21st Birthday to our (not so) baby girl. From the moment you were born you could light up a room. You are a bright light for your Heavenly Father in all that you do. It shows in your beautiful smile, your caring nature, your big heart and all that you do for everyone with whom you come in contact with. You are always quick to offer words of encouragement or the BEST HUGS EVER! You are the daughter, sister and friend that everyone wants to have. You have accomplished so much already. 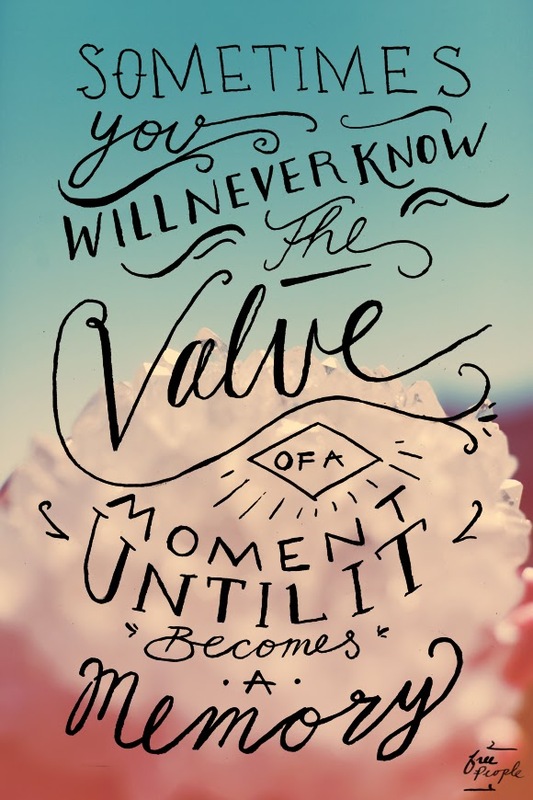 We know great things await you in the future! We love you and pray you have a blessed day!! Mom, Dad, Elie, Kylie and Toby too!! ***Today you can also find me over at Erin's blog Live Pretty On A Penny where I am participating in her Creative Spotlight series. I received word just a short time ago from my radiologist who performed the biopsy last Wednesday. It is not cancerous. It is a benign condition, radial scaring (that can mimic cancer cells on mammography images). However, it does have a potential to develop into something down the road so it is best to be proactive and have it surgically removed at this time. I will be scheduling the surgery (day surgery) soon. From the bottom of my heart, I want to thank each and everyone of you for your prayers and sweet words of encouragement that you kept showering me with all week. I feel so blessed to be part of this wonderful blogging community where we can share our fears with each other, and pray for one another. If I could ask a favor, would you pour that prayer into another blogging friend of mine's family. Some of you are familiar with Jennifer (Beaufortbelle), she is such a sweet encouraging reader of many blogs. Jennifer's beautiful daughter Brooke was recently diagnosed with Hodgkins Lymphoma and is undergoing Chemo. Brooke is a recent college graduate. She reminds me a lot of my two girls, beautiful, bubbly, outgoing and more importantly a kind, caring individual who was always there for her friends and many others. 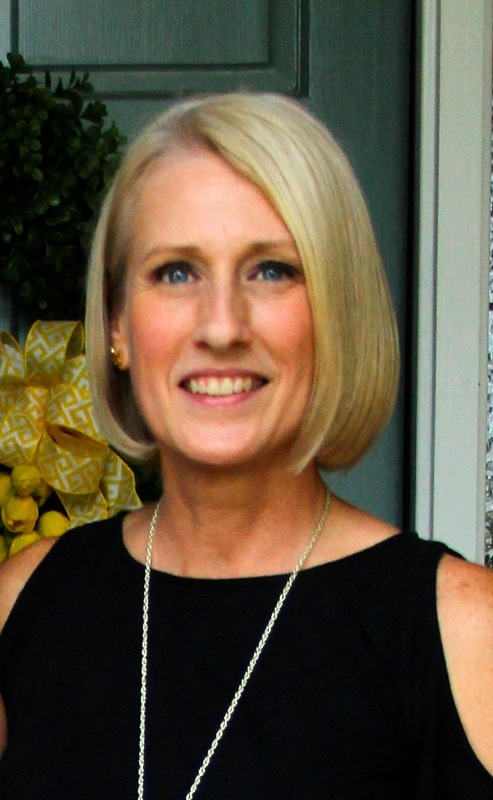 They have created a Caring Bridge site to keep friends and family informed and where we can shower her with prayer! You can visit Brooke (and Jennifer) at One Day At A Time . To leave Brooke a message, scripture verse or to shower her with prayer you just need to create a simple account (email address and password). Prayer is a very powerful thing, and it is what He has commanded us to do for one another. Happy Sunday! 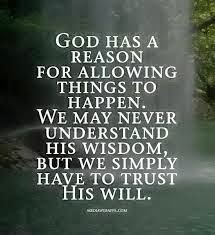 Have a blessed week everyone. Still no word. I was told it could be Monday, and Monday it shall be. Yesterday was hard...the waiting, being hopeful for word, and then 5 o'clock came and went. 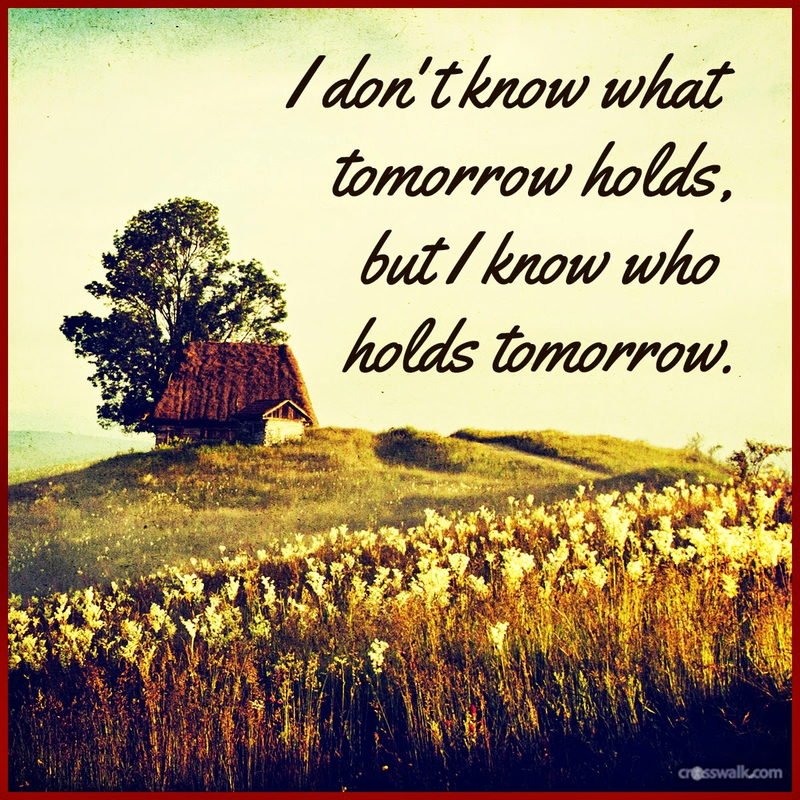 I am still clinging to a quote I stumbled upon just a few weeks ago, "I do not know what tomorrow holds, but I know who holds tomorrow." And, He does. I find my hope in Him. Thank you for your continued prayers and sweet words of encouragement. I was in need of a place to post some of my favorite quotes and sayings, so I created a new bulletin board for my office. I just adore the leopard print fabric that I found at my local fabric store, frugal fabrics. I also love the addition of the greek key ribbon. The green really pops off the blue leopard print. This was such a simple project. All that was needed was a store bought cork bulletin board, some fabric, ribbon and my trusty electric staple gun (a life changer). 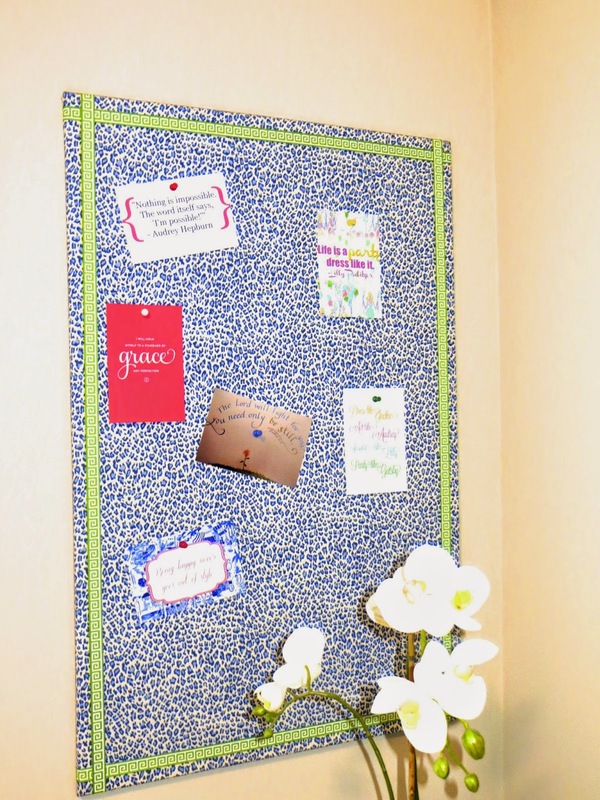 Simply cut the fabric a bit larger than your board, lay fabric right side down on a solid surface, lay the bulletin board cork side down on the fabric, wrap edge around and staple to the back of the frame, folding corners like you would a present. I decided to just add the ribbon in four simple strips creating a frame, however you could go with the traditional criss-cross of a memo board. There are great tutorials for that online. I also decided to add some art to the top of my Ikea expedite. The Live Laugh Love print was created and gifted to me by my sweet #1, the Hey Y'all print is from the Etsy shop-Stephanie Creekmur, the abstract art is one that I personally painted, and the other two are prints of images I found on Google-one a Lilly Pulitzer quote and the other an Audrey Hepburn quote. I love the pop of color they add. The frames are simple white frames I purchased from Michaels during their buy one, get one sale. I have a lot of other fun projects and some organizational things I would like to conquer, but they have taken a back seat until I receive the results back from my resent procedure. I am hopeful that I will have answers possibly later today, but know that it could potentially go into Monday because of the weekend. Now that the temperatures here in the South are finally cooling off, I am gradually adding a few fall touches around our home. I love fall, the cooler temps, the colors, the smells. However, I am not a huge fan of all the Halloween stuff. I prefer to decorate for the season, not just a one day holiday. The touches I add will carry us through until Thanksgiving...which I cannot believe is just two short months away!! A fun frame with the girls picture from fall two years ago (they are begging me to have it done on canvas to replace the existing one). Battery operated candles from Pottery Barn-I love these...you set them and then they come on each evening at the same time and stay on for 5 hours!! The cream ones I use year round and bring out the birch ones in the fall. My beloved dough bowl that holds succulents in the summer months has been filled with 3 small pumpkins. 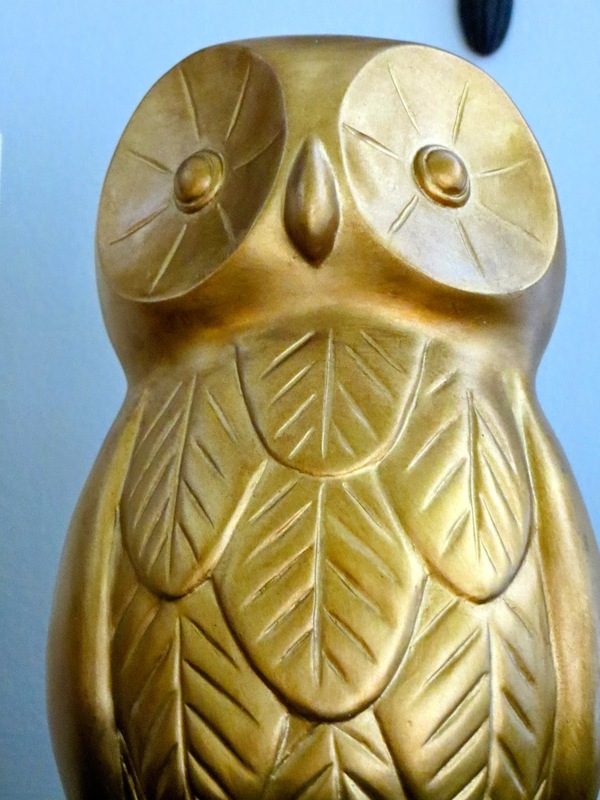 And lastly, my sweet owl I found last fall rounds out the grouping. Love the little pumpkins!! And their bright orange color. This fun frame I picked up at a local gift store called Swoozies. Perfect Southern saying. Just little things here and there. Thank you for your continued prayers and sweet emails of encouragement. I wanted to take this chance to update you all. I am so thankful to all who have prayed for me the past couple of days (and continue to do so), sent well wishes and words of encouragement. The procedure went well this afternoon. Relatively pain free, and quicker than expected. I had a wonderful 3 person team working with me. I feel at peace and am glad to put the test behind me. I should have results no later than Monday morning, and we will proceed from there. 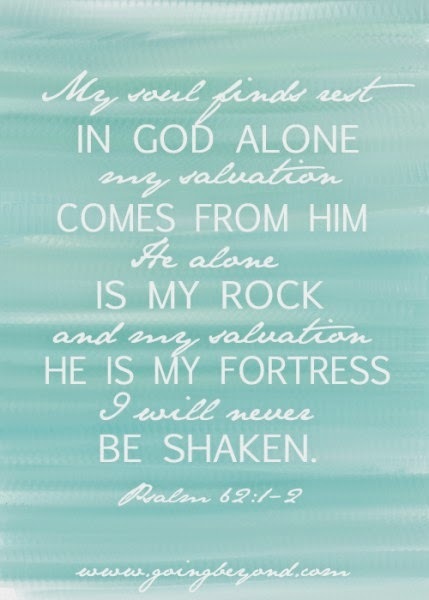 I am forever thankful that my God has gone before me, and is always with me. We made this for dinner last night, and boy were they good! Super simple and perfect for a crazy weeknight. Use a 6-quart slow cooker. Put the butter into the bottom of the slow cooker and turn on. Swirl the meat, onion rings, and garlic around in the melting butter. Add the sugar and pepper. Then stir in the broth, beer, sherry and Worcestershire sauce. Cover and cook on low for 7 hours or until the meat is tender to bite and has begun to lose shape and fall apart. Serve on gluten-free toasted soft rolls with slices of provolone or Swiss cheese. (we put the mixture on one half of the bread, topped with the cheese and toasted to melt the cheese). 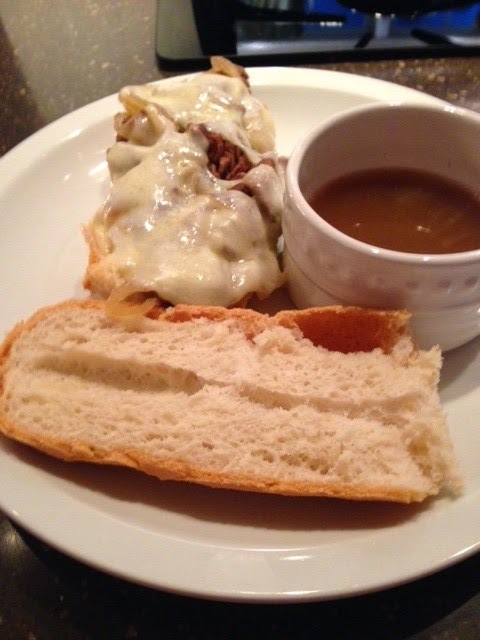 Dip sandwiches into the accumulated broth for a tradional French Dip Sandwich experience. I want to thank everyone for their kind words and prayers regarding yesterday's post. 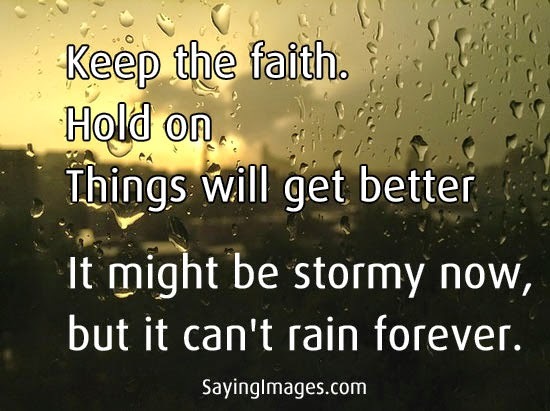 It is comforting to know so many are praying for a good outcome tomorrow. I was a bit hesitant at first to share this information, but I know so many others are currently in my shoes or may be in the future. I went in for my routine mammogram a couple weeks ago. 6 days later, I received a message on my answering machine requesting that I call back the imaging center where my mammogram was performed. I did so, only to hear that this years scans detected a change from last years and they would like to repeat them and potentially do further testing. I was fortunate enough to get in the very next day. The scans were repeated, and then I was told they would like to take a look via ultrasound. Both the technician and the radiologist did not see anything definitive on the screen...just dense tissue. I was asked to follow up in 6 months, something quite routine after a call back. I had a lunch date with two dear friends and was relieved to have the testing behind me. So, you can imagine my surprise when I arrived home and my hubby tells me someone from the office had called and hands me a piece of paper with a name and phone number on it. Apparently, AFTER I left the radiologist was still unsettled by the tests and consulted a colleague. She suggested that they bring me back for a 3D mammogram. That test was today. What they saw on the inital scans showed up again on the 3D scans. They ordered yet another ultrasound. After about an hour, the radiologist came in and said that spot was not detected on the ultrasound clearly. She ordered a core biopsy. This would ensure what they were looking at. The test is scheduled for Wednesday afternoon. I would appreciate any and all prayers on my behalf. I feel at peace knowing that God has gone before me, and is in full control. I also want to strongly encourage all women above age 35 to have their annual mammograms done, and if the 3D test is offered accept it (much better visual). I will blog as I can, and will be sure to post once the results are back. 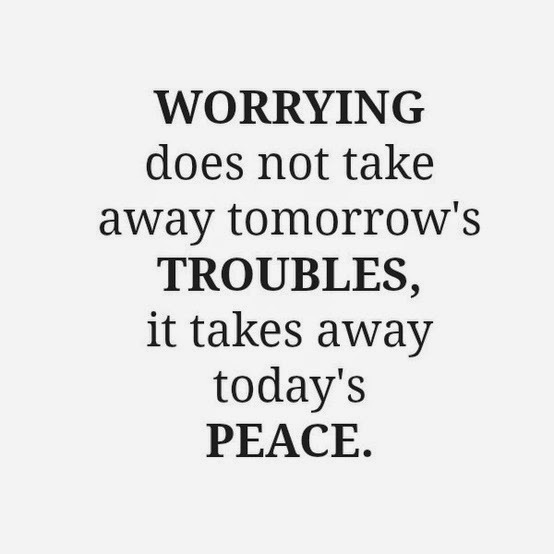 I have to have some further testing done tomorrow, and I have two dear friends who have procedures awaiting them in the morning. 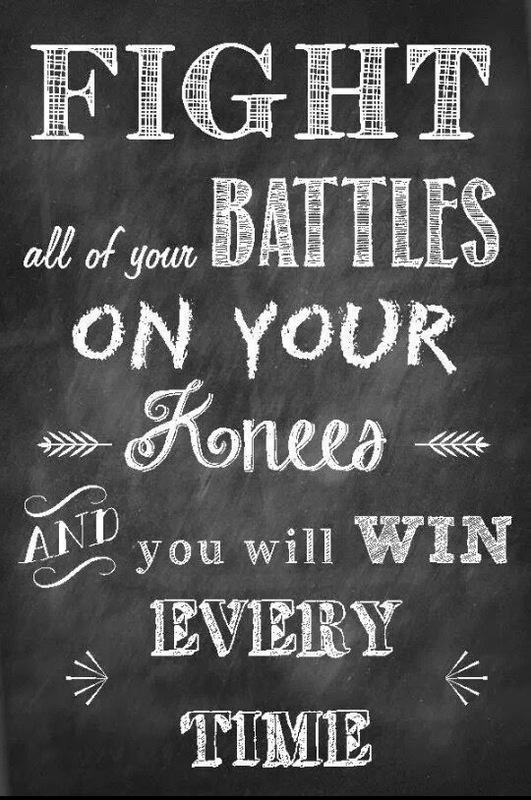 I pray we can all hold tight to this in knowing He has got this!! Last night called for a quick easy meal, and after the latter half of the week I was craving some comfort food. I had to have some tests run, and will have to return for what I hope is the final one on Monday morning. This recipe is super easy to prepare! ***You can adjust this recipe for the number you are feeding quite easily. This makes enough for about 3-4. In a large Ziploc bag place the beef tips. Sprinkle enough flour to coat the meat. Add salt and pepper to taste (we use about a TBS of each). Shake to combine and coat. In a large saute pan, drizzle oil to coat and add minced garlic to taste (we like garlic so I add about a TBS or so). Heat on medium-high heat until garlic starts to sizzle. Add the beef tips. Continue cooking until they are browned. Add about a cup of wine and a cup of the stock-enough to cover the beef tips. Stir to coat, reduce heat and let simmer 20-30 mintues. 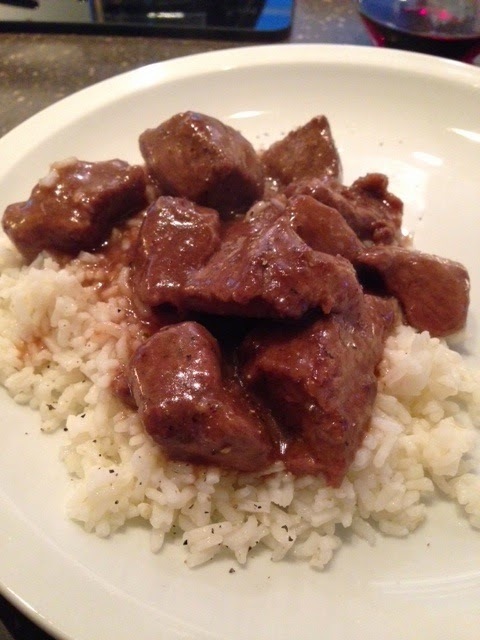 The longer you let it simmer the more tender the beef tips will be. The sauce will also thicken as it cooks down. We serve ours over rice. I told you, easy peasy!!! You can also add in some cut up root vegetables and cook a bit longer for a complete meal. Here's is the Sunday addition of What' for Dinner. If you have followed along for any length of time, you will know I have a tomato allergy. Out of all the sensitivities and allergies that I have, it has been by far the hardest one to deal with...no tomatoes, no marinara sauce, no pizza sauce, no chili sauce, no salsa, no ketchup, no bbq sauce...ok, you get the picture. Well, that is until now...we came across a Tomato-Free Marinara Sauce on Vegetalion. We decided to give it a try. I figured it was worth a shot. It was aaaaHHMAZING! It was the first time I had had spaghetti with "marinara" sauce in a year!!! The recipe for the sauce can be found here. The only thing is we would add a bit more garlic and spices next time. Well, now that we had found a replacement for marinara sauce it was time to test it out on a pizza. 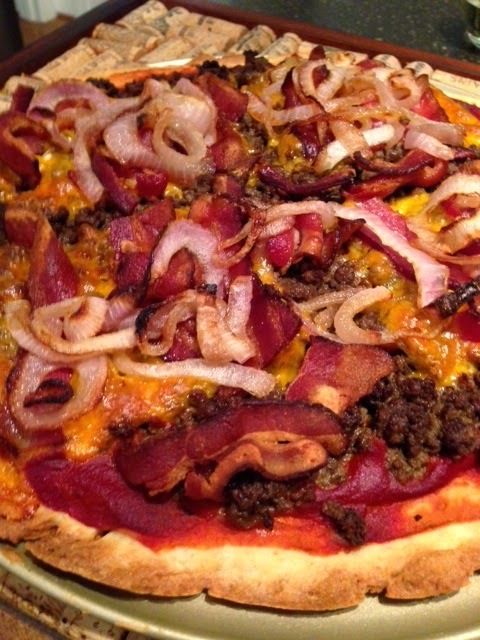 Bacon-Cheeseburger Pizza that is. The recipe is found in Fine Cooking's Pizza on the Grill Magazine 2012. This can be baked on the grill, but we chose to bake in the oven this time around. Mix together the ground meat, Worcestershire, mustard, onion powder, 1/2 tsp salt, and a pinch of pepper until well combined. Preheat a large saucepan over medium-high heat. Add the hamburger mixture and cook, stirring occasionally and breaking up any clumps of meat, until no longer pink. Let cool and reserve for topping. Spread entire surface with the sauce. Top with the hamburger mixture. Place squares of cheese in a square-like pattern, making sure not to overlap them. Top each with 2 strips of bacon and a grilled onion ring so the pizza resembles 4 bacon cheeseburgers. Finish baking according to package directions (or on the grill). Remove, garnish with the pickle slices, and season with salt and pepper. Slice and serve. I also found a company that makes a ready made jar No Tomato sauce called Norine's Nomato Sauce. However, the one little market that carries it in Atlanta was sold out. It can be ordered online. The ingredients are very similar to the recipe we used. How very true. 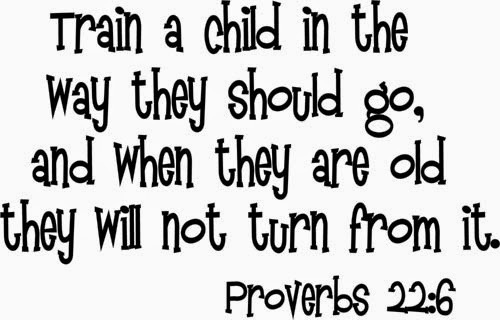 My sweet friend, Paige, had posted this along with some other wonderful quotes. I was reminded of it yesterday after driving around town and revisiting some of my childhood homes. It has been a week of good eating and trying out new recipes my friends. This was actually Wednesday night's dinner. Taco Sliders with Chipotle Aioli from my Paleo Happy Hour cookbook. While the cookbook is all about appetizers, small plates and drinks, many of the recipes can be adapted for lunch and dinner. 1. In a bowl, mix together the ground beef, chili powder, cumin, garlic powder, onion powder, cayenne pepper, and paprika. Form the mixture into 10 small patties (or larger if making regular size burgers), pressing a small thumbprint in the center of each one. Grill or pan-fry the patties for 3 minutes per side (or longer for doneness or if cooking larger burgers). 2. To make the Chipotle Aioli, combine the egg yolk, apple cider vinegar, and mustard in a blender, and blend on low. Drizzle in the olive oil as slowly as possible to allow it to emulsify. Add the garlic, sea salt, honey, chipotle chilies, and jalapeno pepper, and blend the mixture on high until it is smooth. 3. 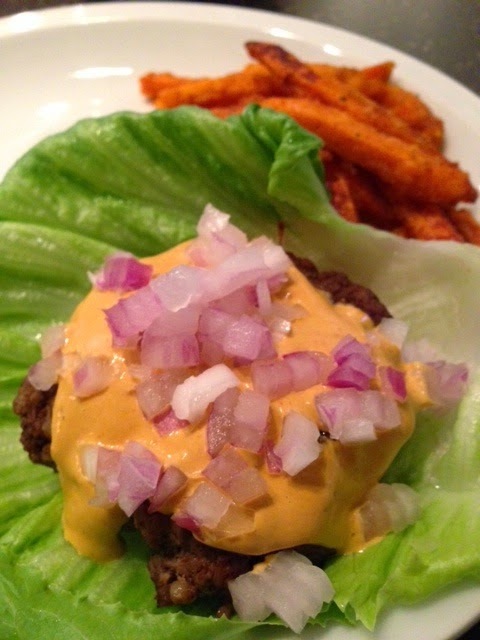 Place each burger on top of a piece of butter lettuce. Top with 1 tablespoon of the Chipotle Aioli, a slice of avocado, and pieces or red onion. We made our patties a bit bigger, so rather than making 10 sliders it made 7 slighter larger (enough for dinner and leftovers). We served them with Alexia's Spicy Sweet Potato Fries (chipotle). I will say the burgers are not for the faint of heart...they were SPICY. You can control the heat by cutting the spices in half or cutting back on the number of Chipotle peppers you use (we used 3, we like the heat). May we remember to pray EVERY day! While we are holding up those events and those affected by 9/11 today, may we remember that it doesn't stop there. Continue to hold those in prayer, pray for our leaders, and our country everyday. Well, if you follow little 'ole me on Instagram, you will know this was actually Tuesday night's dinner. And, man was it good. Not anymore. 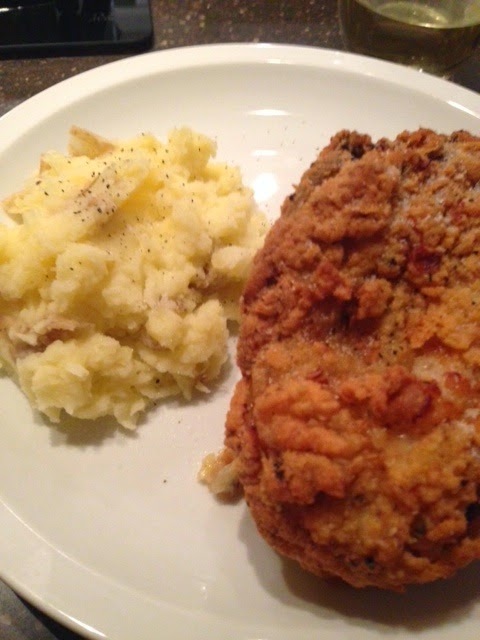 I was CRAVING me some southern fried chicken and while meal planning this past Sunday I stumbled upon this recipe in Ina Garten's Family Style cookbook. With just one substitute, we could make it gluten free. And, it did not look difficult at all not that I cared about the difficulty as I was having hubby make it for moi. After the frying process, but prior to baking in the oven. 2 chickens (3 pounds each), cut in eight serving pieces ***this girl went the easy route and purchased already cut pieces, 2 breasts and 4 drumsticks for us-choose what you want. Combine the flour, salt and pepper in a large bowl. Take the chicken out of the buttermilk and coat each piece thoroughly with the flour mixture. Pour the oil into a large heavy-bottomed stock pot to a depth of 1 inch (hubby used more and found it easier to keep the temp consistent) and heat to 360 degrees on a thermometer. Working in batches, carefully place several pieces of chicken in the oil and fry for about 3 minutes on each side until the coating is a light golden brown (it will continue to brown in the oven). Don't crowd the pieces. Remove the chicken from the oil and place each piece on a metal baking rack set on a sheet pan. Allow the oil to return to 360 degrees before frying the next batch. 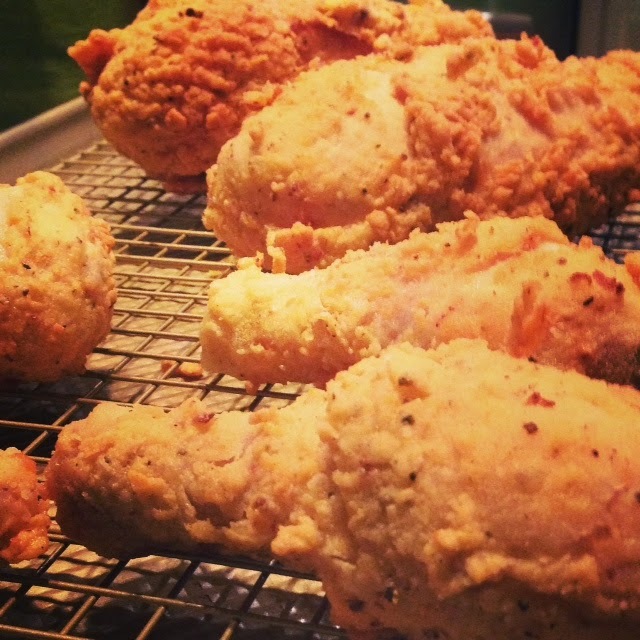 When all the chicken is fried, bake for 30-40 minutes, until the chicken is no longer pink inside. Serve hot. ***the stockpot works out perfectly, unlike when using a traditional frying pan the grease does not fly everywhere!! Mouth Watering!!!! This is hands down the best fried chicken I have ever had, and this girl loves her fried chicken. It was light and not greasy at all! 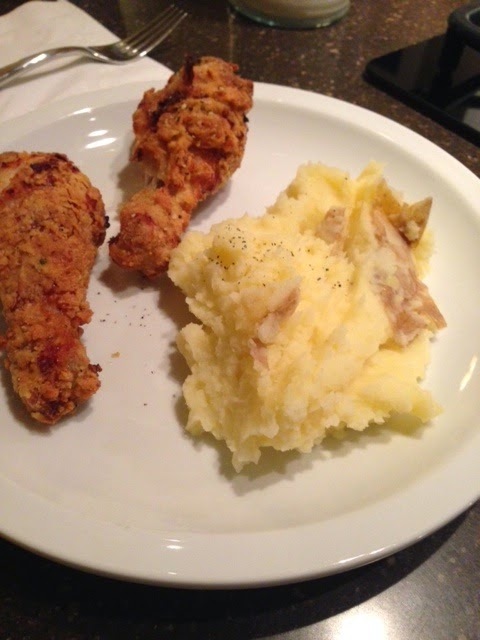 We served it up with a good dose of homemade mashed potatoes. Only thing missing was the gravy (next time). I will let y'all decide whose plate was whose this girl is not ashamed one bit and don't let him fool you, that was only the first plateful. Trying out another new recipe tonight, Taco Sliders with Chipolte Aioli. Will let you know how it turns out. Okay, forewarning...this week it may be all about the meals! We have planned some super yummy dinners this week and I can't wait to share the with you all. 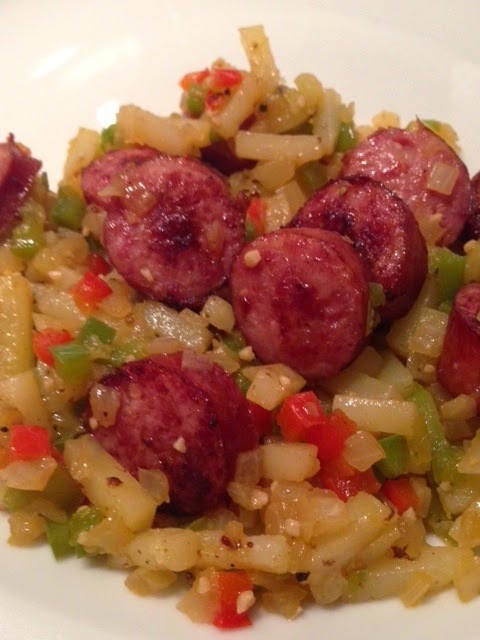 Sunday night's dinner...Kielbasa, Pepper, Onion and Potato Hash courtesy of The Two Bite Club. 1. In a heavy bottomed skillet, heat 2 TBS of olive oil over medium-high heat. Add the potatoes to the skillet and season with salt and pepper. Fry until golden brown and cooked through, around 8-10 minutes, stirring a few times to ensure even browning. 2. In a separate skillet, brown the sliced kielbasa for around 5 minutes in 1 TBS olive oil over medium-high heat. Remove the kielbasa from the pan and set aside. Add the peppers and onions to the skillet and season with a pinch of salt and pepper. Cook for 5 minutes, or until softened, stirring occasionally. 3. Add the cooked potatoes and kielbasa to the skillet with the onions and peppers and mix everything together. Serve nice and hot!! This tool makes the chopping a breeze, vegetable chopper at Williams-Sonoma. And, tonight we are making Fried Chicken...the first time I have had fried chicken since going gluten free...the smell alone is intoxicating! Will share the recipe soon! Right now I cannot wait to dig in. Ok, this one could not wait until next Wednesday's addition of "What's for Dinner Wednesday". 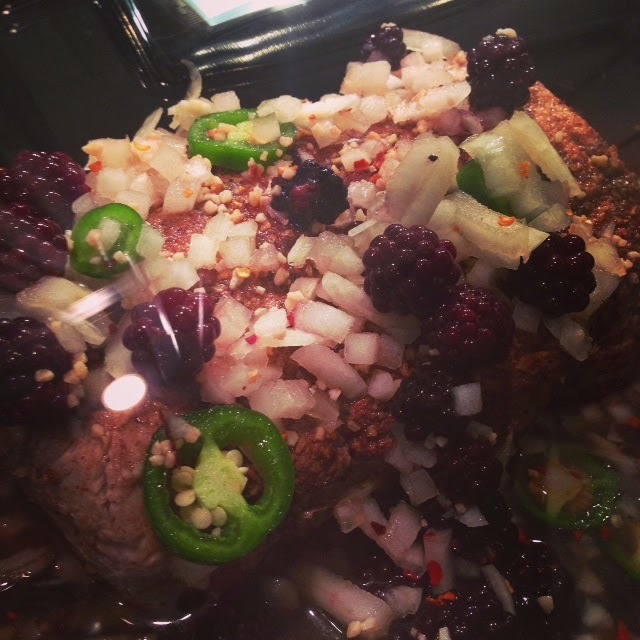 So, without further ado...Blackberry Jalapeno Pork Roast. 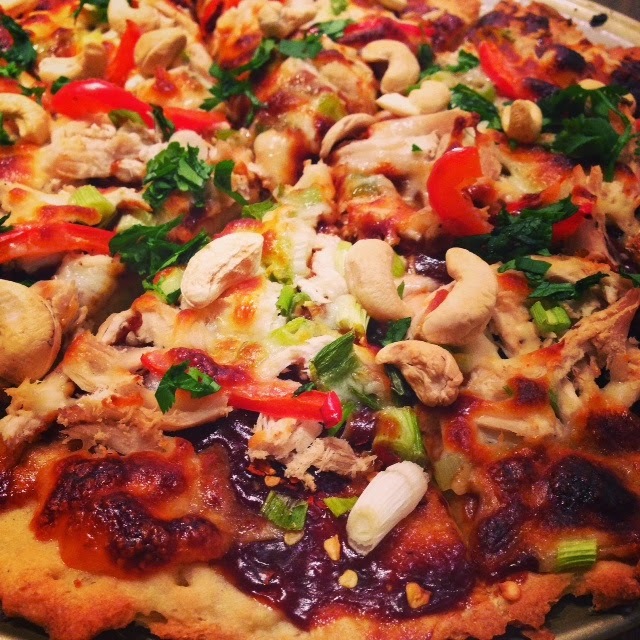 This recipe comes from my relatively new cookbook, Make Ahead Paleo (also Gluten Free). 1. In a small bowl, combine the rub ingredients. 2. Sprinkle the rub over the pork roast, and rub it in with your fingers to thoroughly coat all sides of the meat. (I had already placed my roast in a large ziploc after bringing home from the market, so I added the spices and smooshed!! I know y'all have to love that term, but it worked). 3. In a large skillet, heat the coconut oil (or whatever oil you choose) over medium-high heat. 4. Place the roast in the skillet and brown on all sides, about 8 minutes. 5. Transfer the roast to a slow cooker. 6. In a medium-sized bowl, combine the sauce ingredients. 7. Pour the sauce over the roast in the slow cooker, and cook on low for 6-7 hours or on high 4-5 hours. 8. 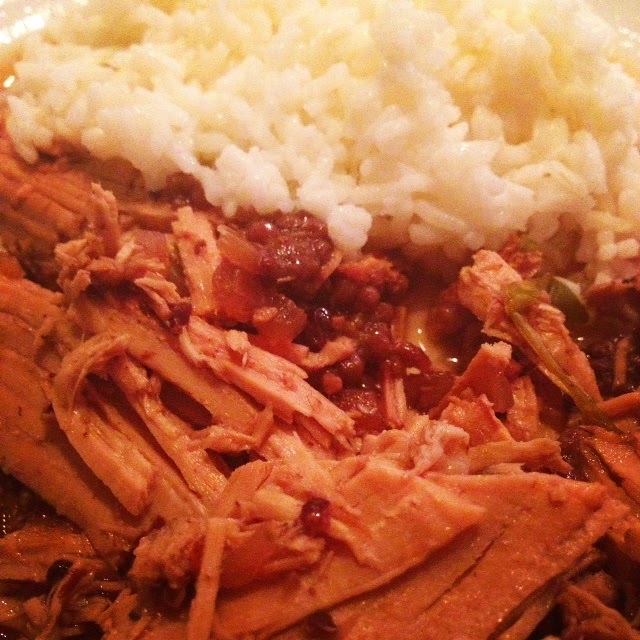 With 2 forks, shred the pork while it is still in the slow cooker. 9. Serve the shredded pork with the juices and berries spooned over the top. We served with rice a side and it was a nice compliment. Here you can see all the vibrant colors of the pork, berries and jalapenos. And while the colors have dulled once cooked the flavors have not!! It was delicious!!! Hope you will give it a go. And with that, I am off for the weekend. Hosting the Children's Team on Sunday for ice cream sundaes!! Today was my first day with my littles for Bible study this year. Who knew that ten 2 year olds could be soooo active. Whew, this momma of now adult children is plum wore out. They are a very sweet, loving, inquisitive group. Can't wait to love on them for the entire year! So, if I am a bit MIA in the next couple days, I will be recuperating until I host our ENTIRE children's leadership team (family style for ice cream) on Sunday!! Once you have prepared the dough and pre-baked crust according to directions, spread the entire surface with the hosin and sprinkle with the red pepper flakes. Top with the chicken, scallions, and pepper strips. Sprinkle with the cheese. Finish baking the pizza utnil the cheese is light golden brown or thoroughly melted. Remove from oven (or grill), sprinkle with the cilantro and cashews, and season with salt and black pepper. Drizzle with the sesame oil (if using), slice and serve.